Just like papers iPhone displays also feature two screen orientations — portrait and landscape mode. By default, the Apple iPhone 6s Plus Home screen orientation is set to portrait mode or vertical/upward view. Unlike the special edition iPhone (SE), the 6s Plus home screen can be switched from portrait to landscape mode by simply changing the way you hold the phone. It works the same with other bigger iPhone flagships like the iPhone 6 Plus and iPhone 7 Plus. Users who would prefer their iPhone home screen to be stuck in portrait view or upward position even when held horizontally can adjust the display settings according to their preference. The same thing can be done on the iPhone applications. However, not all applications have landscape modes. This means that you can only view these apps in portrait mode regardless of how you hold your iPhone. This also denotes the need for you to use both hands when using the device. In that case, there is nothing you can do but to get acclimatize with its design structure. But that only applies to apps that are exclusively designed with portrait screen orientation. If your iPhone 6s Plus screen refuses to rotate even if it is supposed to do so when held sideways or upwards, it denotes that something is wrong with the screen orientation and that needs to be fixed. This post highlights a few recommended workarounds and potential solutions to screen rotation problems on the iPhone 6s Plus. Feel free to refer to this content should you too need some help in fixing pertinent display issue on the same iPhone device. In order to determine if screen rotation works properly on your iPhone, try to hold your device in either position — vertical or horizontal. You can do these assessments on the Home screen or other apps that rotate or switch between portrait and landscape modes. Again, your screen is in portrait mode when you hold your device upright and landscape when it is on its side. Your iPhone screen can be stuck on portrait or landscape views due to several reasons. The problem can be isolated to an application or the iPhone in general. Among the factors that can likely cause screen rotation or screen orientation issues on your iPhone 6s Plus would include but not limited to apps glitches, incorrect display settings, bad updates, faulty gyroscope or accelerometer, and worst, hardware damage. Just like what computer programs, smartphone applications can also glitch as manifested by random malfunctions or errors. As an app glitches, it becomes inoperable for a moment and then goes back to normal. This is typical. Among the symptoms that usually manifest when an application is glitching would include sluggish performance, random crashes or restarts, and frozen display. So basically, the app just gets dysfunctional and inoperable. Glitches are usually triggered by corrupt files or contents. In other cases, memory issues are the main culprit. Some apps require you to configure display settings to enable screen rotation when using them. Incorrect configuration of any of the options within the display settings can result to the same problem on the iPhone’s screen orientation. In many cases, the orientation lock or screen rotation option needs to be reconfigured to get your iPhone screen to switch between portrait and landscape modes accordingly. While software updates are generally designed to optimize iOS devices, some of them contain bugs that can trigger issues to occur in certain apps or the iPhone itself. This is why post-update problems manifest. Screen orientation problems can also likely to instigate after installing software update due to some conflicts with the update’s system requirements and the way you have configured your iPhone’s current system structure. Typically, you will configure your device or change the default settings as you would prefer. Prior to releasing, a series of tests have been conducted by software developers just to ensure that the update implementation goes smooth and flawless. But then again, this may not happen as users have already made various changes to multiple settings on their respective devices. It turns out that the new iOS system structure is not compatible or does not work well with that of the actual system configuration by end-users. Thus, bad outputs surfaced upon implementation of the new iOS. The key components that allow your iPhone to switch between portrait and landscape screen orientations when held in different positions are its motion and direction sensors known as accelerometer and gyroscope. As the name implies accelerometer is used to measure acceleration while gyroscope for determining directions. These two components work hand in hand to enable screen rotation on your iPhone work as it should. If either of these components failed to function, display orientation issues arise. This is when your iPhone can get stuck in portrait or landscape orientation even with screen rotation option enabled on the device settings. You can do some test to see if both the gyroscope and accelerometer are working properly on your iPhone. 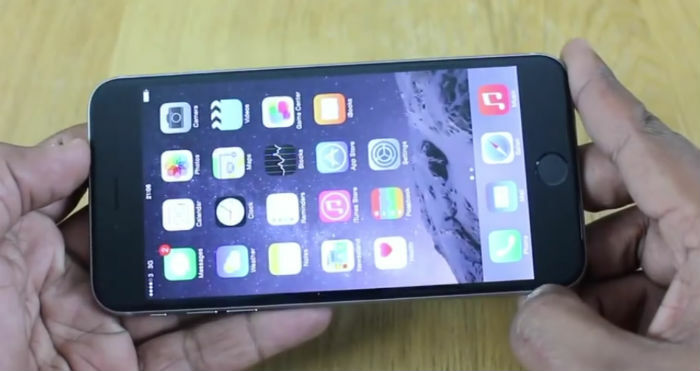 Several screen or display issues reported by iPhone users were tied to hardware damage. This is likely the case if your iPhone got exposed to liquid or dropped. Unfortunately, screen orientation problems caused by physical or liquid damage on the iPhone would usually require service. This means the need for you to take your device to an Apple Genius bar or authorized service center for further hardware assessment and/or repair. Given that the underlying cause of the display orientation problem lies within the iPhone system or software-related, there are still some things you can do to try to fix it by yourself. To further assist you in troubleshooting, I have enumerated some of the recommended workarounds and potential solutions used by other iPhone users in dealing with pertinent issue on the iPhone 6s Plus screen rotation. Before you go any further, be sure to check whether the app you are having issues with screen rotations supports both portrait and landscape modes. Some iPhone apps are designed to work only in one screen orientation, mostly in portrait. In order to save time and effort in performing unnecessary troubleshooting, be sure to check if the app you are having issues with screen orientation supports both portrait and landscape modes. Most gaming apps and browsers are designed to work in both modes while other iPhone apps like Settings works only in portrait view. Music and Activity apps may likewise seem to work only in portrait mode. Some third-party apps are also designed to do the same. Once verified, you may now opt to proceed with the subsequent troubleshooting steps. Don’t forget to test your device after completing each method to determine if the problem has already been resolved. Otherwise, proceed to the next applicable solutions. Press and hold the Sleep/Wake (Power) button until the red slider appears. Wait for at least 30 seconds then press and hold the Power button again until the Apple logo appears. Wait for your iPhone to complete the reboot and then try to see if screen rotation is already working. A soft reset is usually effective in fixing software-related screen problems isolated to an application and could not be resolved by a force close method. Meanwhile, a force restart might be necessary especially if the iPhone screen is stuck to portrait or landscape view when using certain app and the display gets frozen or not responding to touches. To force your iPhone 6s Plus to restart, press and hold the Sleep/Wake (Power) button and the Home button simultaneously for at least 10 seconds and then release both buttons when the Apple logo appears. Your device then reboots and everything should be back to normal again. Motion sensors can fail to work in time. That is why it is highly recommended for them to be recalibrated regularly so as to maintain its proper functionality. Before you go any further, try to perform the following steps to calibrate your iPhone’s gyroscope or accelerometer. Reboot your iPhone by pressing and holding the Sleep/Wake (Power) button until the device powers off completely. After a few seconds, turn your iPhone back on by pressing and holding the Sleep/Wake button until the Apple logo appears. After the reboot is complete, press the Home button to open the Home screen. Locate the Compass app and open it. The app is usually located in the Extras folder or Apps screen. Once you have located the Compass app, tap to open it. You’ll be prompted with the calibrate screen. This is where you can start calibrating the gyroscope on your iPhone 6s Plus. If you don’t see the Calibrate Screen, double-tap on the Home screen and then search Compass. Force close the Compass app and then restart your iPhone. After the restart, open the Compass again. On the Calibrate Screen, tilt the screen to roll the red ball around the circle. Continue the process until the calibration is complete. The Compass app will launch once the gyroscope calibration is finished. When it does, try to go back to the app in which you are having problems with the motion sensors or screen orientation. The problem might be on the display settings especially if the entire iPhone screen orientation function is affected. Just like if the screen won’t rotate on all apps. It’s possible that screen rotation option must have been disabled on the iPhone in this case. To ensure that this is not the culprit, head over to your iPhone settings menu and verify if display settings options are properly configured. Among the options you should check are lock screen and screen rotation switch. By definition, the lock screen feature is used to keep your iPhone in a single display mode like stuck on portrait or landscape. When enabled, the screen won’t switch to landscape even if when holding your phone sideways. In short, your device stays in one screen orientation. From the Home screen, swipe up from the bottom of the screen. Doing so will open the Control Center. Once you’re in the Control Center, locate the Lock Screen or Portrait Orientation Lock icon. This icon looks like a tiny lock inside a circular arrow that is located next to the battery icon. Tap that icon to disable lock screen and at the same time, enable screen rotation function on your device. After disabling the lock screen option, you should now be able to switch between display orientations by holding your iPhone in either direction or position. Another option to check when configuring display settings is the Display Zoom. Some iPhone users who have dealt with screen rotation issues were able to fix the problem by setting the Display Zoom to standard. You might as well give this a try and see how it works. To configure this option, head over to Settings-> Display & Brightness-> Display Zoom-> then set it to standard view by tapping Standard from the given options. Selecting Standard view will allow your iPhone home screen to switch between landscape and portrait modes. But if you don’t it to work that way, select Zoomed instead. Doing so will turn off landscape view, leaving everything on the iPhone 6s Plus screen to appear just a bit bigger. Finally, tap Set on the upper right side to implement the changes. After making changes to these settings, reboot your iPhone and then try to see if screen rotation is already working properly afterwards. Software bugs might have possibly caused your iPhone screen orientation to not work as intended. Typically, minor bugs or software glitches can be remedied by a standard reboot on the iPhone (soft reset). However, there are just some bugs that are tough enough to withstand the power of reboot. This means a definite fix is already necessary. Aside from new features and system enhancements, software updates also integrate fixes to certain bugs transpiring in iOS devices. Thus, it might be the key to fixing the screen problem triggered by some bugs. To get started, check for available updates by heading over to Settings-> General-> About-> then open the Software Updates menu on your iPhone. A notification will be prompted if an update is available. Before going any further, backup your iPhone through iTunes or iCloud. To implement the software update, select the option to Download and Install. Doing so will initiate the download and installation of the software update on your iPhone 6s Plus. Simply follow the onscreen instructions to complete the entire process. This method is optional and should only be considered a last resort especially if the problem persists after completing all the aforementioned procedures. By definition, a factory reset will wipe your iPhone system, and restore it to factory defaults. That being said, you are going to lose all your personal information and added contents afterwards. On the positive note, any software bug or glitches residing in any of your previous contents will also be eradicated. Thus you are likely to get a bug-free iPhone as the reset completes. Head over to Settings-> General-> Reset menu on your iPhone. If prompted, enter your Apple ID and password to continue. Tap Reset Device, then select the option to Delete All. If necessary, tap Delete All again to confirm action. Your iPhone will now instigate the factory reset. Once the reset is finished, your iPhone will reboot. It can take longer for your device to complete the entire process especially if you have a lot of contents. If you have ran out of options and the problem remains or screen rotation is still not working as intended on your iPhone 6s Plus, then you should now consider requesting further assistance from Apple Support. It turns out that the problem is already beyond your capacity to fix and therefore a more advanced troubleshooting tool is required. Escalating the problem to Apple Support is also recommended for it to be included in the next set of priority problems to fix in the next iOS update. However, if contacting Apple Support is not your option and that you suspect that the hardware is at fault, then you can take your device to an authorized service center instead.